[CONTINUED FROM YESTERDAY] Part of the entertainment of the early Wall Street protesters was a high school dropout protesting… something?? Surprisingly, this particular nitwit could not clearly articulate what he was protesting. Perhaps he should’ve been at Home Depot or Lowes filling out a job application; hopefully he can at least read and write. I’m not going to suggest that he should have been working on his GED because that would require a level of intellect wherein one can plan for the future. Perhaps this misguided fellow is intellectually challenged, maybe I can have some pity for this poor bloke. No, I will save my pity (and my charity) for somebody more deserving, say our injured military heroes. Another protester/nitwit was a “trust fund baby” in disguise. He was at the protest by day and stayed at a $700 a day hotel by night. Presumably he showered everyday and was one of the better smelling protesters. It was odd in those early days how even the purportedly college educated protesters could not articulate what the movement was about. We know they were college educated at least to some extent because they were bawling about having to pay off college loans. (Ha! I finally got BAWL in here!!) By the time Halloween rolled around I actually considered dressing as an occupy Wall Street protester. The costume was going to be authentic; made of organic free-range hemp clothing sprayed with that stinky “Dead-Head” oil and tie-dyed with environmentally friendly non-toxic colors. But I was afraid dressing this way even for one night would DECREASE my humongous carbon footprint. I endeavor to increase my carbon footprint (as real as unicorns?) because I want to be sure I leave something behind when I go to that great blog in the sky. Eventually we learned, perhaps I should say that the elite media collectively determined, that all the occupiers whining and bawling (There’s BAWL again!! ), or perhaps just 1% of the bellyaching, would fall under the rubric of demanding “economic equality”. Kind of like a Robin Hood type story wherein occupiers would take from the rich, however that is defined, and give to the poor, apparently defined as any occupy protester. Sadly the occupy Wall Street movement showed their true colors once hungry homeless folks started to infiltrate their “open” protest and tried to get some of the food that was being donated to the occupiers. Occupy wants to redistribute wealth, cold hard cash, to themselves and other members of the idiocracy but would not share food with hungry homeless folks who THOUGHT they had found friends. Thus, to use their very tired rhetoric, you have the 1% (“evil”), the entitled 99% (“good”) and then you have hungry homeless folks who are not entitled to any of the occupiers food (“hungry”). I love irony. [to be continued???] TALK TO ME – AM I WRONG, RIGHT OR SOMEWHERE IN THE MIDDLE??? 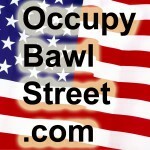 This entry was posted in Politics, Humor-Parody and tagged occupy bawl street, occupybawlstreet, occupy wall street, occupy movement, NYC, wall street, early, first days, NYC homeless, 1%, 99%, opinon, commentary, blog, wall, Street by obs. Bookmark the permalink.